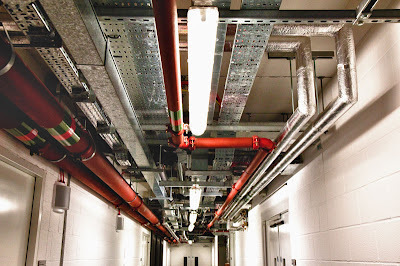 I love seeing the working side of buildings, pipes, wires basements. All I find have beauty rather like sculpture really. Do any of you share my fascination? Go down at night and note the beasties running around! I do enjoy this kind of thing too. Especially when the pipes and wires form such neat lines and angles. I've spent plenty of time in boiler rooms and basements. Yes, the well maintained ones are fascinating and very photogenic. I used to love using the back elevators at the giant downtown department store because they had glass doors and open shafts. You could see all six sets of cables, pulleys, weights, and cars working. Those operators would hit the stops to the millimeter. Usually the facade isn't the most interesting part of the building. Lots of stuff is happening behind the closed doors. I find them interesting and have posted a few shots, but in general I have questioned whether it would be a solitary interest. at yours -- you make even pipes cool! Definitely Mo, it's always good to see what makes something 'tick'..
Mo, if you like the 'inner workings', of buildings, check out photos of Alfriston College/High School in Auckland. You'll be impressed. And, with this one, I looked at it for several seconds in the 'wrong direction' . . . first thinking I was looking down towards the pavement from a tall building, then down a lift shaft . . and even when I tried a different possibility I didn't immediately recognise the shapes as doors. Really interesting and colourful picture.